The Birman is a laid-back, unobtrusive cat with beautiful markings and robust health. Birmans once lived in Buddhist temples, providing companionship for priests. The Birman cat was a sacred companion to ancient Burmese Kittah priests. Buddhist legend has it that Birmans were once white cats with yellow eyes, until a beloved priest named Mun-Ha was killed in a raid on the temple. His beautiful cat Sinh stood on the body of his master at the moment of death, facing an effigy of the temple goddess Tsun-Kyan-Kse. Sinh’s white fur turned golden, and his eyes changed to the vivid deep blue of the goddess. His legs, tail and face transformed to the color of earth, but his paws, touching the priest’s body, stayed white to indicate purity. All other cats in the temple—100 in total—took on this coloring. When Sinh died seven days afterward, he took the soul of the priest Mun-Ha to paradise. Thereafter, whenever a temple cat died, it was believed that the soul of a priest accompanied it to paradise. Little is known of the early history of the Birman, though it is likely that the breed was domesticated in Burma by priests. When the temple was again raided just before the turn of the century and Buddhist priests were driven from their native country, they received assistance from two military men from the west, Auguste Pavie and Major Gordon Russell. Two Birmans were brought clandestinely to France in 1919, where Pavie and Russell were living, and some believe that the cats were given to the men as a gift to thank them for assisting the priests. However, the cats may have been smuggled in as pets for someone else. Of the first two Birmans brought to France, the male died on the journey but the pregnant female, Sita, survived. The Birman breed was established in the western world from this single cat. A pair of prolific Birmans with the unlikely names of Orloff and Xenia de Kaabaa later helped to promote the species, and there were soon many Birmans in Europe. However, breeding programs suffered during World War II and at the end of the war, just two Birmans were left alive in Europe. It took many years for the species to recover. Birmans tend to be large, stocky cats with silky medium-length fur that is not inclined to tangle. The cat has light-coloured fur with a slightly golden cast and points—legs, tail and face—of a darker color that can be chocolate, seal, blue, red, cream, tortoiseshell or lilac. Birmans have round eyes, usually blue, heavy jaws, full chins and snowy white feet. Birmans are often mistaken for other breeds such as Burmese, Himalayan, Ragdoll, Siamese and Snowshoe. Birmans are known to have one of the most pleasant dispositions of any cat breed. They are usually gentle, laid back and docile. While playful and affectionate, they tend to be unobtrusive and quiet, not bothering busy owners, and usually spend quite a lot of time lazing around the house. One of the more intelligent cat breeds, Birmans require little training and usually have no trouble learning to use the litter box. Birmans have soft voices, and tend to only speak if dinner is late in arriving or they have been given insufficient attention that day. Birmans love people and are usually accepting of other household pets and children. Birmans are robust, healthy cats that tend to live for 13 years or more. They do suffer from hair balls, like most long-haired cats, however. But adding a bit of oil to their food can help to prevent this problem. Oil products such as Katalax, Laxatone and Petromalt come in flavours cats enjoy, including tuna, malt and liver. In addition to checking Birman newsletters and clubs online such as the Sacred Cat of Burma Fanciers, there is also a Breeder Referral List Homepage for Birmans. Birman Society Inc. (n.d.). “Birmans as Pets.” Users.BigPond.com/Birman-Society. Hofve, J., DVM. (n.d.). “Hairballs in Cats.” CatsofAustralia.com. Kopper, D., Kivivuori, T., Weeks, E., & Lamb, L. (1999). “Birman FAQ – Frequently Asked Questions.” Birman.org. Schone, H., & Sacred Cat of Burma Fanciers, Cat Fanciers Association. (2007). 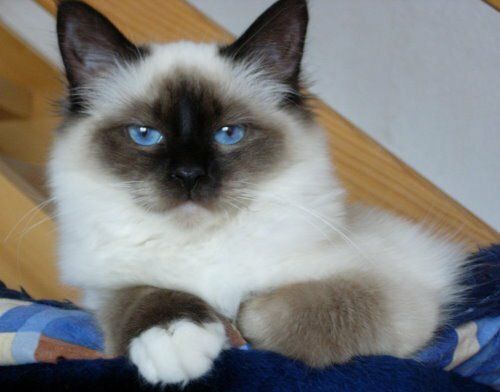 “Breed Profile: Birman.” CFA.org.